Now with improved image quality and even faster 3D, Apocalypse 3Dx brings arcade-level 3D games to your Pentium PC. Designed to run the latest 3D games, Apocalypse 3Dx uses the new NEC PCX2 processor and 4 Mb of SDRAM on-board texture memory, to produce explosive acceleration for 3D games. Unlike existing solutions, Apocalypse 3Dx has the power to deliver complex effects at very high frame rates, making your games more responsive, more detailed, and more involving than ever before. And, as well as providing an outstanding platform for 3D games, Apocalypse 3Dx brings the growing range of 3D Internet and multimedia applications to life. Compatible with all current VideoLogic graphics cards, and all DirectX-compatible graphics systems, Apocalypse 3Dx supports titles developed for Microsoft Direct3D or the VideoLogic/NEC PowerSGL. Fast becoming a standard for high-performance 3D, Apocalypse 3Dxs PowerVR architecture is endorsed by a wide range of game developers including Interplay Inc., Sega Entertainment, Virtuality KK, Looking Glass Technologies Inc., Activision, Mindscape Inc., Kalisto Entertainment S.A., Psygnosis Ltd., and Gremlin Interactive Ltd.
Apocalypse 3Dx uses the NEC PCX2 processor, based on the revolutionary PowerVR technology developed by VideoLogic and NEC. With enhanced geometry setup on chip, PCX2 is rated at 9 billion operations/sec, processing up to 1.2 million polygons/sec, with pixel fill rates of up to 66 million pixels/sec (dependent on processor performance). This increased performance allows higher frame rates and resolutions, such as 800 x 600 and 1024 x 768 in 16-bit and 24-bit colour. Apocalypse 5D supports all the features needed to deliver stunning 3D realism, including bilinear filtering, perspective-correct anti-aliased texture mapping, pixel perfect hidden surface removal, light volumes, real time shadows, true logarithmic coloured fog, translucency, and smooth shadingall in true colour and real time. 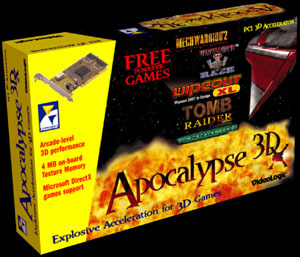 Compatible with Microsofts DirectX APIs, Apocalypse 3Dx accelerates Windows 95 Direct3D titles. Dedicated to high-performance 3D, Apocalypse 3Dx is a single-slot PCI card that works with your Windows 95 graphics card or graphics controller (DirectX 3.0+ compatible). Makes 3D easy. No switches, no jumper settings, just plug in the card, run the setup software, and go! 5 year warranty. Technical support hotlines. Internet web site, ftp, and BBS services.